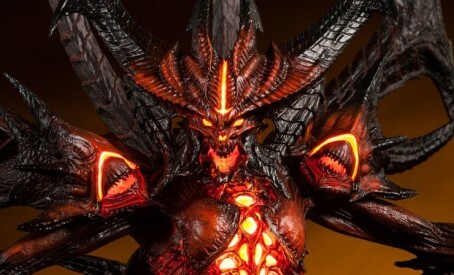 The shipping date for the Sideshow Collectibles Diablo Polystone Statue is drawing near — Expected to ship November 2013. Sideshow has updated the statue with brand new lights which make the statue stand out even more than before when plugged to a power source. This Limited Edition consists of 2000 statues. There are two pre-order options. The flat price is $349.99, with the Flex Payment Plan for as little as $105.00 and a non-refundable $35.00 to secure your copy. Sideshow Collectibles is proud to bring you the Diablo statue, from Blizzard Entertainment’s hugely popular action RPG Diablo III. In a brilliant collaboration between the award-winning Sideshow Design and Development and Blizzard Cinematics teams, led by Sideshow Collectibles Creative Director Tom Gilliland and Blizzard Cinematics Creative Director Nick Carpenter, the Prime Evil’s chosen form comes to life, crafted in high quality polystone. The Diablo statue measures over 20 inches tall, hand painted and finished with painstaking attention to detail. Possess it now, before it possesses you. Brian Fay (Sculpt), Dave Cortes (Sculpt), Blizzard Cinematics Team (Sculpt), Nick Carpenter (Creative Direction), Tom Gilliland (Creative Direction), Anthony Mestas (Paint), Rick Cantu (Paint).